If you have crooked teeth, you may be unhappy with your smile. Misaligned teeth can make you feel self-conscious about talking, eating, and laughing around others. 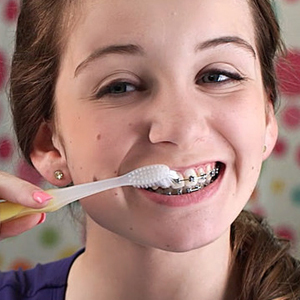 You may think that braces are only for teenagers or that it’s too difficult to move teeth in adulthood. But your Williamsburg family dentists Drs. Ricky Rubin and Brett Dunnill offer braces to correct your smile at any age. Some people avoid talking to their family dentist about braces because they fear what it will look like. Braces are very common for teenagers so they may not be seen as so unusual. But people often get more embarrassed to have braces as they get older. Thankfully your Williamsburg dentists have options that may not make you as self-conscious as traditional metal wires and brackets. Ceramic Braces – This type of orthodontic solution is very similar to traditional metal braces. However, the major difference is that the brackets are made of a ceramic material which blends into the tooth’s natural color. This can make the braces less visible than the traditional metal brackets. Lingual Braces – For a truly invisible option, lingual braces may be the perfect solution. Lingual braces function the same as traditional metal braces, but instead of being on the front side of the teeth, they are placed on the back side where they will not be noticed. Not every patient is the right candidate for lingual braces, but your Williamsburg dentists can help you find out if they are right for you. Invisalign – These comfortable and nearly invisible plastic aligners are removable for brushing and flossing and can offer a more discreet look than traditional brackets. Many adults find that Invisalign is the preferred method of orthodontic correction because there are fewer dietary restrictions and they can offer protection from tooth grinding. Whether you’re 15 or 55, your dentist may have an option for braces that will help straighten your teeth and give you a smile you can be proud of. Williamsburg Family Dentistry offers a variety of orthodontic treatment options to meet your needs. Schedule an appointment today by calling (757) 345-5500 and love your smile at any age.